The ring route starts in Duino and will lead you uphill to the hamlet of Ceroglie and the Ermada mount, two places that staged some of the most important battles of the First World War. The route continues downhill toward Slivia and the ruins of its "Castelliere" settlement and passes through the hamlet of S. Croce, once inhabited by fishmongers. The way back is through Aurisina, a village famous for its limestone quarry excavated by the Romans and still used nowadays to extract the typical local limestone blocks. 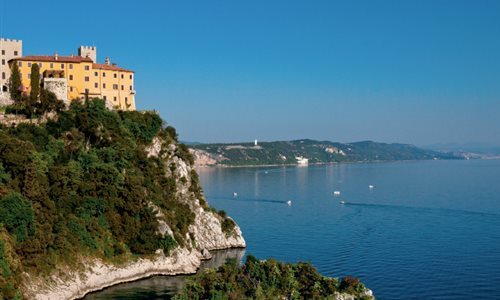 Duino is the village where the Karst meets the Sea, where the coastline plummets into a protected bay. Duino is a village rich in tales and legends. The most popular are f the mythical White Lady and of the world renowned poet Dante Alighieri. To rent a bicycle here and enjoy a pleasant stay, enquire at Carsokras.